IndyCar’s season finale at Sonoma brought with it a sense of possibility and finality. As the final race ever at Sonoma (for now) and one destined to bring home glory for one of the four men in championship contention, it was always going to be good. 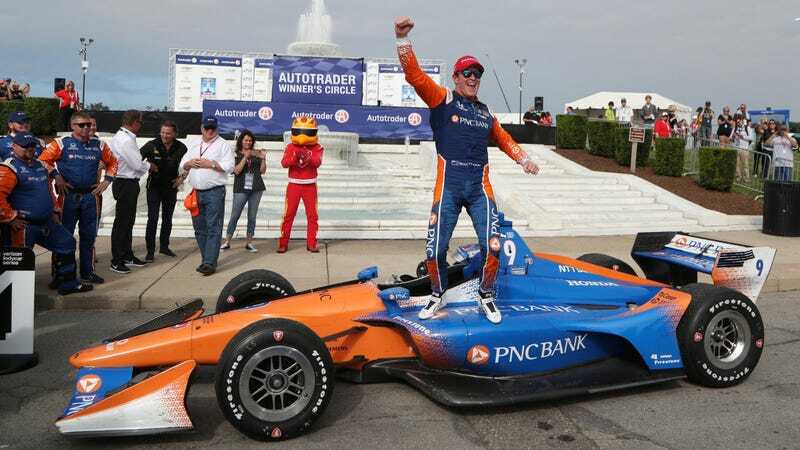 But, at the end of the day, it was Scott Dixon who brought home his fifth record-matching championship. Scott Dixon entered the weekend with the championship lead. But with just the right blend of luck, talent, and circumstances, Alexander Rossi, Josef Newgarden, and Will Power were all in contention with a chance to steal the title. Dixon was racing for his fifth championship. Rossi was racing for his first. Newgarden was defending the title he won last year. Power was seeking a championship win to enhance his 500 win earlier this season. The championship was just out of grasp for the two Penske drivers; this race was really going to come down to a Rossi-Dixon head-to-head. Sonoma is one of those races where your qualifying position is decently important. You want to start the race in the best possible condition to ensure you aren’t going to get caught up in the first lap carnage with everyone desperate to round out the season with a good showing. Alexander Rossi learned that the hard way. Rossi’s championship pursuit this season was nothing short of incredible. He’s successfully proved himself as a well-rounded driver with wins on a street circuit (Long Beach), road course (Mid-Ohio), and oval (Pocono), one who isn’t afraid to rub wheels with the drivers whose position he wants. But with the pressure of a potential championship hanging over his head, Rossi fell short. On the first lap, Rossi (who had qualified sixth) ran into the back of his teammate Marco Andretti. He immediately dropped down the field, and, after a pit stop, ended up a lap down. Pole winner Ryan Hunter-Reay and second-place Scott Dixon both held strong to their starting positions for the duration of the race, never really challenging each other. Power was their most consistent competitor, settling out in third place for most of the race. But the complexion of the race changed when a yellow flag came out after Graham Rahal’s engine just completely died, leaving him stranded on the side of the track. Rossi had already been able to unlap himself. At that point, he was able to start charging up the field. After just two laps, he’d cruised from eighteenth to ninth. Things didn’t quite look so secure for Scott Dixon during the last third of the race. Rossi was moving fast, slicing his gap to the leaders from sixty to eighteen seconds. But this is racing. Tires and fuel don’t last forever. Rossi’s hard charge was necessarily slowed by a need to preserve himself and finish the race. Rossi delivered a drive worth of a championship, but it wasn’t quite enough. The incident at the start meant that, instead of powering up through the front of the field, he was just trying to get himself out of trouble. We can only imagine what could have happened had he avoided the collision with this teammate—but it’s the little things like these that can make or break a championship. Scott Dixon’s season shouldn’t go unnoticed. He was able to secure race wins at Detroit 1, Toronto, and Texas, but his consistency paid off. Rossi had more podium finishes than Dixon, but Dixon more frequently placed in the top ten, and, in many cases, higher than Rossi. And Dixon’s drive at Portland, coming back from the first-lap accident that could have ended his race as it did for many of the other cars involved, was as incredible as Rossi’s at the finale. They were both incredible contenders for the title this season. Coming into the final race, Dixon had scored 598 points. Rossi had scored 569. With a double points race to close out the season, that gap could have easily closed. But the tides turned in favor of Dixon. That extra smidge of reliability, that little bit of extra experience: in the end, that made all the difference. Rossi’s championship contention was eye-catching, fiery; he could be as aggressive as he was impressive. Dixon, on the other hand, was far steadier and quieter about his pursuit. It was always going to be hard to charge the veteran driver, but if anyone was capable of doing it, it was Alexander Rossi. Dixon is the first driver since AJ Foyt to score five championships. That’s a phenomenal statistic, given the fact that there have been over five decades of capable drivers since that point. It’s time to celebrate one of the most legendary drivers of our time. How Many Playoff Drivers Does It Take to Finish a NASCAR Race?